On February 9, 2010, Pennsylvania Governor Ed Rendell (D) unveiled a $66.4 billion budget. The general fund portion is $29 billion, 4.1 percent higher than the current general fund. 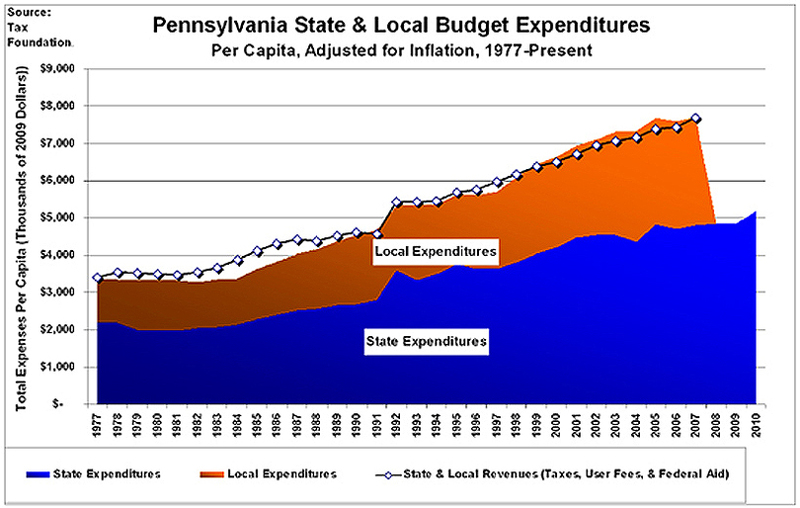 (See Figure 1 for Pennsylvania’s state-local revenue and expenditures over time.) The budget includes significant tax proposals. Broaden the state sales tax and lowering the rate from 6% to 4%. The change would eliminate many unjustified exemptions but would double-tax some retail items by taxing business-to-business transactions. The largest unjustified exemptions (most groceries, clothing, legal and medical services) would remain. The change would be a net revenue increase despite the rate reduction. Eliminate sales tax vendor compensation. Reduce the corporate income tax rate from 9.99% to 8.99%, eliminate the cap on net operating loss carry-forwards, but impose combined reporting and single-sales factor apportionment. The net result of this package of positive and negative reforms would be an increase in business tax burdens, particularly for out-of-state businesses. Impose a new severance tax on natural gas extraction. Seek federal aid by increasing unemployment benefits and exploit the federal Medicaid matching fund system. Governor Rendell’s budget proposes lowering the sales tax rate by two percentage points and expanding the state sales tax to a number of currently exempted goods and services. Groceries, clothing, prescription drugs, tuition, and legal and medical services will remain exempt, but most other goods and services will be brought into the sales tax base. Unfortunately, the proposal would also tax many business inputs like advertising, fuel, and truck transportation, which will result in double taxation for some final goods and services. A properly structured sales tax applies to all consumer purchases of goods and services, but not to business purchases. The purpose of this exemption is not to promote business in general but rather to avoid the double taxation of some products. Tax scholars agree that business-to-business transactions should be exempt from the general sales tax. Taxing business-to-business activities not only adds to the cost of doing business and raises consumer prices, but it also distorts the allocation of capital as the sales tax cascades through some production lines but not others. State tax codes are filled with many politically-motivated special interest carve-outs, the result of which is that the government’s tax system induces consumers to favor certain industries, activities, or products over goods and services that they otherwise would prefer. Excessive carve-outs, particularly of widely purchased items like groceries and clothing, greatly increase the volatility of sales tax revenues. Each carve-out necessitates additional statutory definitions and regulations, increasing complexity. If such tax preferences are few, substantial revenue can be raised with low tax rates. Governor Rendell’s list of repealed exemptions is large enough that even after lowering the rate by a third, Pennsylvania will collect more sales tax revenue. This change would raise $531 million in FY 2011 and nearly $900 million in FY 2012. Sales tax broadening proposals often face significant opposition, particularly when only some services are included or when they are not revenue-neutral. In 2007, Maryland sought an expansion of its sales tax base to “luxury” services but beneficiaries of the exemptions targeted for elimination resisted. In the end the expansion included only one (lobbyist-less) group in Annapolis: computer services. They quickly hired lobbyists and that expansion was rescinded as well. Already, the Rendell proposal has been declared “dead on arrival,” either because it is a net revenue increase or because the current exemptions are defended by politically powerful interests. Source: Tax Foundation. Dollar figures are in constant 2009 dollars. Revenue figures are from the U.S. Census and state revenue and budget reports. Inflation adjustment is GDP Deflator data from the St. Louis Federal Reserve. Population figures are from the U.S. Census. Local tax data after 2007 are not available and local tax data for 2001 and 2003 represent the average of surrounding years. Revenues or expenditures associated with state liquor stores, utilities, or insurance trusts are not included. Currently, those required by law to collect and remit sales taxes for the state are permitted to keep part of the gross for their administrative costs of acting as tax collectors. This would be eliminated, a change estimated to raise $76 million in FY 2011. Gov. Rendell’s proposed modest reduction in the corporate income tax rate and uncapping net operating losses are positive steps, but their benefits are undermined entirely by the imposition of combined reporting and single sales factor, both of which are designed to increase business tax burdens. These changes as a package are estimated to raise $66 million in FY 2011 and $167 million in FY 2012. Pennsylvania has the second highest corporate income tax statutory rate in the United States, and its corporate tax system is ranked 37th best out of the 50 states in our most recent State Business Tax Climate Index. If Pennsylvania were its own country, it would have the highest overall corporate tax rate in the world at 41.5% (federal plus state, accounting for the state-local deduction). Rendell’s rate reduction is modest and does not outweigh some of the other proposed changes. Pennsylvania’s high corporate tax rate should be a red flag to lawmakers worried about the state’s economic growth, wage growth, and overall competitiveness. An important study released last year by economists at the OECD found that of the various taxes a country can impose, “Corporate taxes are the most harmful tax for economic growth.” The administrative and compliance costs of corporate income taxes are also considerable. At the same time, the use of tax incentives, the abandonment of apportionment uniformity, the proliferation of tax planning opportunities, and the rise of pass-through entities like LLCs have led to a long-term decline in state corporate income tax revenues. For all the harm it does, the corporate income tax will raise only approximately $1.8 billion, compared to $8.6 billion for the sales tax, $10.3 billion for the individual income tax, $1.2 billion for the gasoline tax, and $1.5 billion for telecommunications taxes. The deduction for net operating losses helps ensure that over time, the corporate income tax is a tax on average profitability. Without the net operating loss deduction, corporations in cyclical industries pay much higher taxes than those paid by stable industries, even assuming identical average profits over time. Put simply, the net operating loss deduction helps level the playing field among cyclical and non-cyclical industries. The vast majority of states permit companies to apply NOL deductions to future returns or past years’ returns. The longer and less capped that the net operating loss deduction is, the higher the probability that the corporate income tax is being levied on average profitability. Pennsylvania is one of just two states (New Hampshire being the other) that limit NOL carry-forwards. Faced with lower corporate income tax payments from in-state companies, Gov. Rendell proposes two measures that will raise revenue by making it more expensive for out-of-state firms to do business in Pennsylvania. One is requiring unitary combined tax returns for corporations and all their subsidiaries, and the other requiring that tax liability be determined only by sales in the state and not by property or employees. At one point, states uniformly apportioned corporate income taxes by a “three-factor formula”: one third based on the location of employees, one third based on the location of property, and one third based on the destination of sales. In hopes of keeping or attracting in-state businesses, states over the past few decades have abandoned uniformity and adopted formulas double-weighting sales or even consisting entirely of sales. States that adopt such a “single sales factor” apportionment formula are essentially shifting the corporate tax burden from in-state businesses with lots of property and employees to out-of-state businesses with substantial sales into the state. Such efforts increase the complexity and disharmony of state corporate income taxes, often reduce revenues, and generally fail as economic development tools. Similarly, states that adopt combined reporting believe that they can extract revenue from more profitable out-of-state enterprises under a corporate umbrella than from those enterprises currently within the state. The record of mandating unitary combined reporting is mixed, but revenue windfalls are unlikely, particularly as corporate lawyers and accountants adjust their operations and tax planning to minimize the additional tax burden. The steady decline of the corporate income tax as a revenue source is partly due to national trends, partly due to the discouragement of investment the tax causes (Pennsylvania also has a hefty capital stock or franchise tax, a 1930s relic that most states have moved away from; the state is phasing it out by 2014), and partly due to Pennsylvania’s love affair with economic development programs through the state tax code. Single sales factor also undermines a justification of taxation that economists call the “benefit principle,” which holds that taxpayers should realize a benefit from the taxes that they pay. Under single sales factor, some large Pennsylvania firms would pay little or no corporate income tax, despite the fact that their property is protected by state and local police and their employees’ children are educated in Pennsylvania schools. Instead, companies who use little in the way of state services would shoulder a larger burden of the tax. Instead of imposing combined reporting and single-sales factor apportionment, Pennsylvania should consider a less burdensome tax system for all businesses. Ending the franchise and capital stock taxes immediately, reducing the corporate tax rate more than just one percentage point, and winding down economic development tax incentive programs would do more to address the state’s economic and fiscal problems in the short and long term. This tax is estimated to raise $161 million in FY 2011. Severance taxes are ultimately passed on to consumers in an opaque way, which makes them a popular go-to tax for states with natural resources. This would enable the state to receive a one-time $270 million federal stimulus grant. The change would increase the state’s costs by $60 million per year indefinitely. Gov. Rendell proposes to generate additional revenues by shifting Medicaid costs to the federal government. This is an increasingly popular tactic used by some states for bridging their budgetary gaps, at the cost of increased dependence on the federal government. Generally states dedicate some tax revenue to qualify for additional Medicaid matching funds from the federal government (Pennsylvania receives $1.70 for every $1 of state Medicaid spending). Those extra federal dollars are used for Medicaid services, but can substitute for existing state spending that can thus be freed for other purposes. Medicaid is an entitlement program, and so long as states meet eligibility criteria, federal matching is open-ended. As states get more federal funds for Medicaid, the federal government must tax or borrow to pay for this spending increase. With the 2009 stimulus bill increasing the federal matching rate by an average of 8.7%, states have even more incentives to exploit the Medicaid matching fund system to generate revenue for their budgets. Ultimately, however, health provider taxes are a short-term solution that can undermine health care providers, and rely on the tenuous continued existence of a dysfunctional Medicaid matching fund system. Gov. Rendell’s budget plan still has a $525 million deficit. Pennsylvania is one of the states that last year used one-time stimulus money to backfill their budgets, postponing meaningful steps to prioritize public expenditures. Consequently, the state now faces a built-in multi-billion dollar annual budget gap from those disappearing federal revenues. Rendell proposes using tax increases to bridge that gap, but even those aren’t enough to completely close it or address future budgets. Some of Rendell’s proposals—broadening the sales tax while lowering the rate, uncapping losses that businesses can deduct, lowering the corporate income tax rate—are moves in the right direction. But the budget also boosts spending significantly, relying on one-time money, out-of-state businesses, and the federal government to do so. Without reprioritizing expenditures, slowing the rate of state spending, and meaningfully addressing the state’s structural deficit, Governor Rendell may have difficulty selling his proposal to legislators and the people of Pennsylvania. Governor of Pennsylvania, “2010-11 Governor’s Executive Budget,” http://www.governor.state.pa.us/portal/server.pt/community/governor%27s_web_site/2985. Advertising; Administrative Services; Residential Utilities: Electric; Financial Institution Fees; Custom Programming; Consulting; Residential Utilities: Fuel Oil/Gas; Accounting; Architectural and Engineering; Scientific research; Professional and Technical; Basic Television; Liquor or Malt Beverages from Retail Dispensers; Services to buildings and dwellings; Amusement & Recreation Industries; Coal; Water and Sewage Services; Waste Management; Personal Care; Common Carriers; Residential Utilities: Telephone; Candy and Gum; Parking Lots; Gratuities; Specialized Design; Manufacturing exemption (public utility); Non-Prescription Drugs; Newspapers; Funeral Parlors; Truck Transportation; Other personal services; Parks and Campgrounds; Personal Hygiene; Dry Cleaning; Rental of Films for Commercial Exhibition; Textbooks; Air Transportation; Theater, Dance, Music Tickets; Information Services; Caskets; School Buses; Call Center Credit; Museums, Historic Parks, Zoos & Parks; Magazines; Charges for Returnable Containers; Bad Debts; Horses; Commercial Vessels (Equipment and Maintenance); Investment Metal Bullion; Catalogs and Direct Mail Advertising; Flags; UCC Filing Fees; Commercial Vessels Construction and Repair; Other Transportation; Airline Catering; Tourist Promotion; Hotel-Permanent Resident; Firewood; Stair Lifts; Construction of Memorials; Helicopters; Fish Feed; Trout; Electrical, plumbing, heating, AC; Motor Vehicles (out-of state purchasers); and Wrapping and Packing. See e.g., John L. Mikesell, Thomas S. Neubig, Robert J. Cline, & Andrew Phillips, “Sales Taxation of Business Inputs: Existing Tax Distortions and the Consequences of Extending the Sales Tax to Business Services,” 35 State Tax Notes 7 (Feb. 14, 2005), http://ssrn.com/abstract=665702. See Joseph Henchman, “Maryland Covertly Singles Out Computer Services for New Tax,” Tax Foundation Tax Policy Blog (Dec. 17, 2007), http://www.taxfoundation.org/legacy/show/22809.html; John Wagner, “Computer Services Firms Want Sales Tax Repealed,” Washington Post (Dec. 9, 2007), http://www.washingtonpost.com/wp-dyn/content/article/2007/12/08/AR2007120801405.html. See Amy Worden, Mario Cattabiani, & Angela Couloumbis, “Rendell’s budget boosts spending and broadens taxes,” Philadelphia Inquirer (Feb. 10, 2010), http://www.philly.com/philly/news/homepage/83994572.html; John Luciew, “Pennsylvania’s retailers debate fallout of Gov. Ed Rendell’s proposal to extend the sales tax to more items,” PennLive.com (Feb. 9, 2010), http://www.pennlive.com/midstate/index.ssf/2010/02/pennsylvania_retailers_debate.html. Tax Foundation, “State Corporate Income Tax Rates,” http://www.taxfoundation.org/legacy/show/230.html. Kail Padgitt, 2010 State Business Tax Climate Index, Tax Foundation (Sep. 22, 2009), http://www.taxfoundation.org/legacy/show/22658.html. Iowa’s statutory rate is higher, but federal deductibility makes it less burdensome than Pennsylvania’s corporate tax. See Scott Hodge, “Pennsylvania’s Tax System-Not Weak Economy-Responsible for Job Losses and Out-Migration,” Tax Foundation Fiscal Fact No. 201 (Dec. 2, 2009), http://www.taxfoundation.org/legacy/show/25569.html. Asa Johansson, Christopher Heady, Jens Arnold, Bert Brys and Laura Vartia, “Tax and Economic Growth,” Organization for Economic Cooperation and Development (OECD) Economics Department Working Paper No. 620 (Jul. 11, 2008). 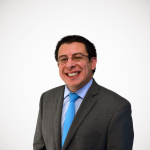 See David Brunori, State Tax Policy: A Political Perspective (Urban Institute 2005) at 83-97. See, e.g., Joseph Henchman, “Pennsylvania Governor’s Borrowing Proposals Short-Sighted,” Testimony to the House Republican Policy Committee (Feb. 27, 2008), http://www.taxfoundation.org/legacy/show/22974.html; Joseph Henchman, “Debate on Film Tax Credits in Pittsburgh,” Tax Foundation Tax Policy Blog (Apr. 13, 2009), http://www.taxfoundation.org/legacy/show/24611.html; Joseph Henchman, “New Pennsylvania Study: Film Tax Credit Pays for Itself Only Under Bizarre Assumptions,” Tax Foundation Tax Policy Blog (Jun. 4, 2009), http://www.taxfoundation.org/legacy/show/24742.html. See Justin Higginbottom, “State Hospital and Medical Provider Taxes: Not What the Doctor Should Order,” Tax Foundation Fiscal Fact No. 203 (Dec. 9, 2009), http://www.taxfoundation.org/legacy/show/25599.html.